For the first time in my life, I have (well, okay, it’s not mine…but I live there alone for as long as it lasts) a place to myself. A flat with a kitchen and living room, a bathroom, and two bedrooms. I don’t use the bed to sleep, since the mattress is causing me pain in the back as far as you could call the mattress a mattress. I sleep on the floor in the other bedless bedroom on the remnants of a couch with printed strawberries and bananas on the back. I have a washing machine that goes on walks, that eats my socks and that once bombed me with a bottle of detergent that was in its way on one of those walks. But the best thing of the place, is my balcony. It’s not a fancy one, but it’s quite large to me. I have a tree trunk as a seat, and two buckets with sand and my recently planted tomato plants. Sometimes I get a free petal-rain from flowers from the neighbor (or neighbors? I never see anyone) above. I can sit on the balcony when it rains, without getting wet. In the nights when I can’t sleep, I sit on the balcony watching the stars. The balcony is a perfect place to observe the world. I’m happy with the balcony, it adds so much to the place. My view from the balcony is on the river, a tiny waterfall and on duck-world. Duck-world is a small place where the river splits in two ways and where a group of ducks lives. Brown duck, White duck, and a few black&white or white&black ducks. I often observe them. They are funny creatures for sure. Though there is one thing that was noticeable for me somehow, I never hear them make sounds. Sometimes when I get home they are in front of the building strolling around. Earlier when I was sitting on the balcony eating a sandwich and drinking some coffee when I looked down and noticed three of the ducks standing there. I had some bread left (I got some huge bread, way too much for me alone) so I thought I should share, and so I threw some down. They ate it. 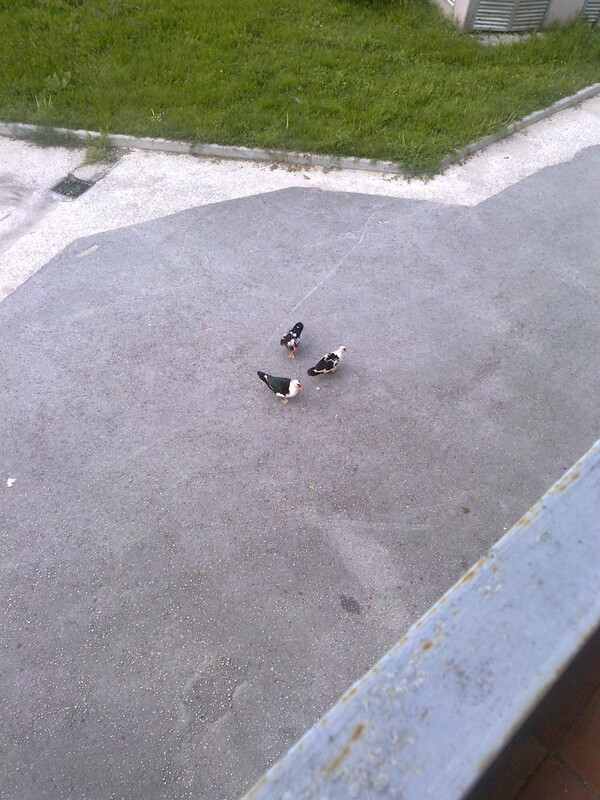 Since then, sometimes, I have ducks standing under my balcony when I’m sitting there. I can see at the way they look at me when they would like to have some bread.They never speak. They just stand there and watch at me in a particular way. I nod, go inside, get some bread, and share it with them.